MOSCOW, Idaho – Next to hoisting a trophy at the end of the year, the best day in a football season might be the day players report for fall camp. Nobody has jumped offside yet, thrown an interception, fumbled or missed a block or a tackle. Sauntering around in T-shirts under an August sun, the players look big and capable and practically glow with possibility. This was the occasion Friday at the University of Idaho. The Vandals reported for work for their first season back in the Big Sky Conference in 22 years. The initial practice on the Kibbie Dome turf is late Saturday. But after player position meetings Friday, coach Paul Petrino met with a handful of reporters and didn’t try to contain smiles as he contemplated answers to questions about this year’s team. He said he gets a good vibe from this group. 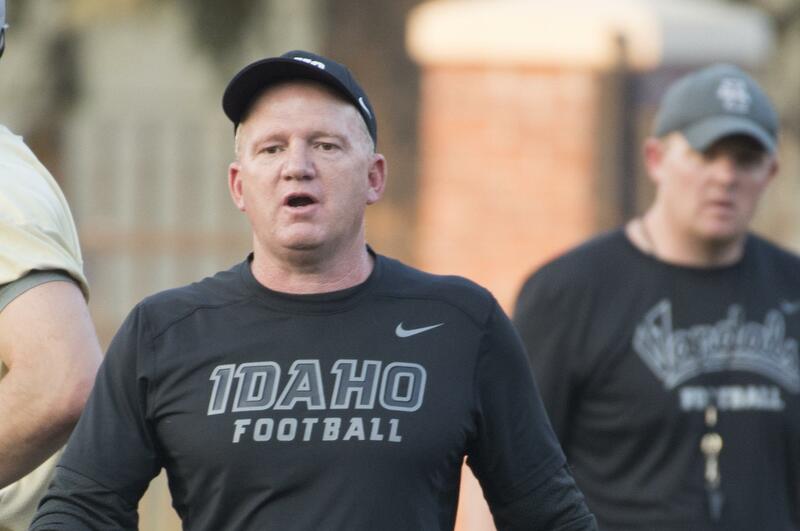 Petrino had a general impression of what Idaho will see in the Football Championship Subdivision Big Sky Conference after coming from the Football Bowl Subdivision Sun Belt Conference. Another first take – the Vandals might be quicker than most of the teams they play. Petrino said this will lead to an early emphasis on special teams play in the preseason, and Idaho’s defense is likely fast enough to pressure Big Sky offenses. Petrino said senior defensive lineman Ben Taliulu and junior Cameron Townsend are coming off impressive springs. Sophomore Rahsaan Crawford might be listed on the roster at 5-foot-10, 331 pounds, but on the first day of preseason that seemed unlikely. The linebackers are led by seniors Ed Hall and Kaden Elliss, and Idaho doesn’t lack for talent in the secondary. Juniors Denzal Brantley, Lloyd Hightower and Sedrick Thomas are returning starters, although Brantley missed 10 games with an arm injury. Also back for a senior season is cornerback Dorian Clark. Petrino said that’s crucial from a leadership standpoint. “There’s no better guy I’ve been around in my coaching profession,” Petrino said. In a league that tries to score points, the Vandals will hardly come to games empty-handed. Sophomore Colton Richardson and junior Mason Petrino are going into a preseason quarterback competition that is close enough that when games start each could get on the field, especially in early games, Petrino said. A deep rotation at running back is led by senior Isaiah Saunders, who rushed for 506 yards last year. Idaho lost its four leading receivers from last year, but Petrino said redshirt freshmen Cutrell Haywood and D.J. Lee improved during spring and are ready to challenge for starting roles. Whoever is quarterback will have the pleasure of throwing to Elliss, Idaho’s two-way phenomenon. Besides starring at linebacker, he is expected to catch passes this year as a tight end and a 6-4, 240-pound wideout. Elliss also has an understudy, Connor Whitney, a freshman from West Valley High School. At 6-3, 200, he is not yet as physically imposing at Elliss, but Petrino said Whitney has excelled on both sides of the ball in Idaho’s football summer camps the past two years. He’s going to get a chance to play both tight end and linebacker. Why not? At the start of the season, all things seem possible. Published: Aug. 3, 2018, 5:10 p.m. Updated: Aug. 3, 2018, 5:37 p.m.